Cornerstone Cellars is small producer based in Napa Valley best known for the high quality Cabernet Sauvignon they've been producing for 18 vintages. Over the years they've branched out to other grape varieties (Sauvignon Blanc), regions (Oregon), and with Stepping Stone price points ($16-$35/btl). The idea with Stepping Stone is "to produce beautiful wines of outstanding quality that are both reasonably priced and capable of expressing their full charm and complexity in their youth." Not a second label to their pricier ($59+) Napa Cabs but rather a label of wine that delivers high quality that's ready to drink on release. From the winery: "The Sauvignon Blanc Musqué clone is responsible for some of the finest Sauvignon Blancs in California. Used by many wineries as a blending component, a few wineries are now using the Musqué clone as if it were a unique grape variety – Sauvignon Musqué." My Tasting Notes: Detected very little residual sugar- this wine tastes very dry. Would have expected rounder flavors from California. More Loire in style than New Zealand, but without the minerality you'd expect in Loire. For my palate, it was almost searingly acidic without food. Is this typical of the Sauvignon Musqué clone? My Tasting Notes: The color of watermelon juice. Gets more apparent aromatically as it comes to room temperature which may or may not be a good thing. Some strawberries on the nose. Its quirky, somewhat bitter flavor profile might disappoint those looking for a summer guzzler- or even a porch sipper. My Tasting Notes: I remember drinking a Chimney Rock Cabernet Franc years ago and I thought it was great. It single-handedly sent me on a Cab Franc buying spree that lasted for over a year. Affordable CA Cab Franc was hard to come by and I don't think that's changed a whole lot since. This one at $30 is an intriguing play. I thought the wine was reminiscent of Cab Franc from cooler climates but this one had darker color and more oomph on the palate (we see Cab Franc produced here in New England as well, some of which is grown in New York). A hint of bell pepper at first but then comes big ripe red fruit. Sizable tannins for a wine aimed at approachability. Not for the faint of heart. From the Winery: "From the Carneros vineyards of Southern Napa, the 2008 Stepping Stone Syrahhighlights the special nature of this region. The various combinations of terrain, geology and marine moderated temperatures provide unique winegrowing conditions. The results are wines with deeper, more stable color and mouth-filling, textural tannins, all with slightly more acidity and refreshing fruitiness. A dollop of generous Red Hills Grenache adds a warm roundness to the blend." My Tasting Notes: California Syrah is hard for me to get excited about sometimes. I don't know what to expect of it and too often it just tasted like run of the mill red wine. This one included unfortunately. Dark in color with mild red raspberry aromas, some leather and white pepper. Sharp acidity with somewhat harsh edges. Apparent heat from the alcohol. Succeeds in bringing flavor and presence but lacks control. Shows potential? Would have liked it more with warmer characteristics. A little unfriendly. 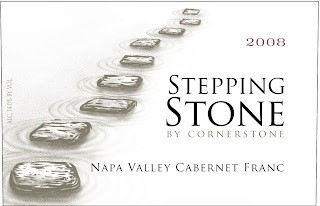 Winery Notes: "Our 2008 Stepping Stone Cabernet Sauvignon is a concentrated, multi-layered wine where the dark, rich fruit dominates as the palate expands, but the acid remains lively, juicy and focused. The tannins are long, youthful and satisfying and bring richness and length to the palate. While enticing, generous and elegant upon release, this wine will become even more delicious in the cellars of the patient among us." My Tasting Notes: Ah- here is the warmth I was looking for in that Syrah along with some other nice characteristics to boot. Fruit-forward and nicely accompanied by chocalate/vanilla notes in the background. Still a little edgy at this point, else I'd have been more impressed with it. The tannins are still quite apparent and somewhat abrastive. I'd bet this improves with just a year of bottle age. One of the more interesting discussions from the tasting, I thought, was whether $35 is a pricey bottle of wine. Whether something is expensive or not depends largely on personal perspective so I can only answer for myself here of course but I do consider $35 a pricey bottle of wine. It's a price that's near the top of the target budget for a lot of wine consumers and a price at which I think it's relatively easy (thankfully) to get an outstanding bottle of wine. In terms of Napa Cab in particular there are some great wines available somewhere around the $35 price point. Honig, Chappellet Signature, and Snowden come to mind. Then there's labels like Chappellet Mountain Cuvee, and Buehler that come in closer to $20. And if you're willing to explore Sonoma or Washington you can drive the price down even further and still enjoy a wine with similar flavor profiles as Napa at a fraction of the cost. I mention all of those to explain where I'm coming from when I say "$35 is a pricey bottle of wine- they better be good!" Taking that into consideration I thought the Stepping Stone Cabernet Franc was one of the more interesting plays in the bunch because I've found it more difficult to find a good examples of California Cabernet Franc in the $30 range. I found the flavor profile intriguing and enjoyed the density of the wine.